So here is one of those pages that didn’t exist before Faris drew it. I added the text after the fact. 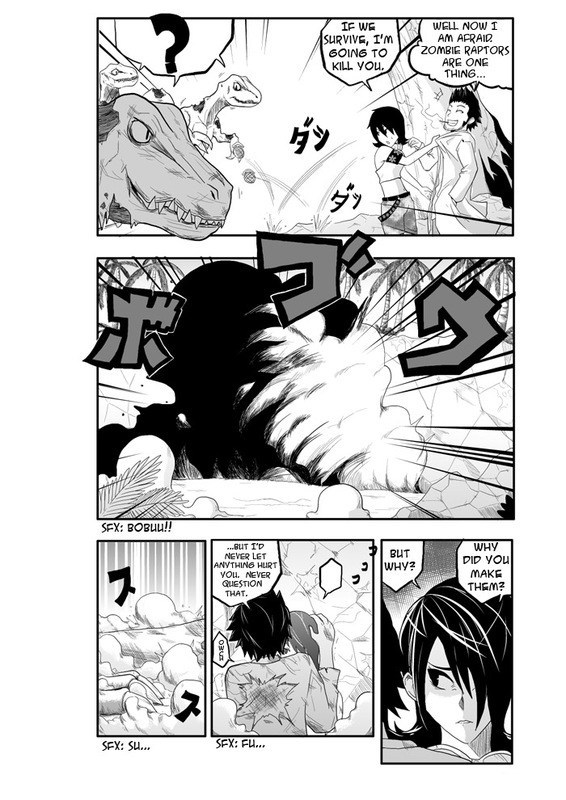 It turned out rather well and is kind of a sweet moment or as sweet as y0u can get when battling zombie raptors. One note on artists adding or changing pages after you send them the script. It is actually something that happens quite a bit. From the artist’s perspective they see a way to do something really cool on the page. From the writers perspective… well let’s say writers don’t like it. The advice I gave Faris and the advice I give all artist is to ask first before drawing the page. Writers hate asking artist to change a page, or at least a considerate writers do. It takes an artists hours to make a page and the writer just a fraction of that write the page. So most of the time when an artist goes off script the writer struggles to work in the changes to the script and silently seethes about the artist destroying their vision. The next time the writer has a project that he/she wants to do guest who is not getting a call about the project. You ask ahead of time no problem, most writers like input. Surprise the writer and you might as well delete that contact from your address book. It amazes me how often artist do these silly things that loose them self work. “Why did I make them? For FUN SCIENCE of course! Ah yes, silent seething. I guess it’s kind of like when a film is made based on a book, and the stuff on the screen looks nothing like the images you got in your head when you read the book. Except when you’re not collaborating with the person who made the film, there is no need to seethe silently. readers love it. so, why should interrupt? If you could clone dinosaurs, would you?